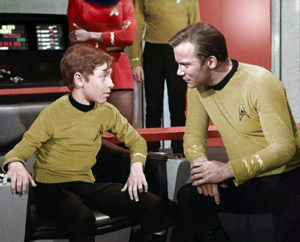 In this episode, we finally get to meet some unfortunate victims of Captain Kirk’s family. His brother Sam (played by Shatner with a moustache) is DOA in this plot. Aurelan, his sister-in-law, and Peter, his nephew. Aurelan dies in a very memorable scene in sickbay. Peter never really comes out of it, at least in the footage that made the cut. There was a scene filmed, intended to be at the very end of the episode, in which Peter appears on the bridge and tells his Uncle that he is staying behind on Deneva. “It doesn’t even look real!” You said it, Yeoman! I know the show was on a tight budget, but could they have made the parasites a little more believable? It doesn’t take away from the potential of the story line for me if they are 100% realistic or not. The viewer has to suspend their disbelief to the max on this aspect of the story. 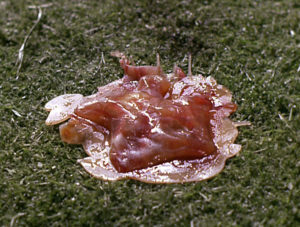 I feel that someone who doesn’t know what they’re watching could flip over to this and instantly think the show is hokey because of these rather fake looking parasites. What saves this episode for me is the excellent performance, as always, from Leonard Nimoy. Spock has to go through a lot here to find the solution of how to cure the Denevans of this affliction. Isn’t it convenient that he has the forgotten inner eyelid? Those Vulcans, saving the day in unexpected ways!